In print the short story can be spare and effective, but in the face of stiff competition from other media it is no longer hugely popular. 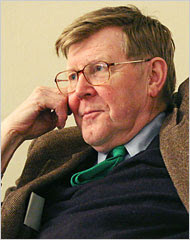 In his collection of TV monologues, Talking Heads, Alan Bennett has devised a TV format which is very similar to the short story form in its impact, and with the same demands on the writer for economy. Each story is told by a single actor, talking straight to the camera and telling the story. When talking to strangers intimacies can be revealed which cannot be shared with family or friends. "Them two things with pink ends that men like." "What is it now? Lad comes on a bike. Folks stood at the door weeping." Commercial telegram operation began in 1839 and telegrams were used to mark great events in family life. Births, marriages and deaths were announced by telegram. In the First World War the first news that a loved one had been killed came via a telegram. Violet’s generation was promised a war to end wars in 1914 and the memory of the loss of so many young men is still vivid to her. When she's asked, "What war?" She snaps back angrily, "The proper war. When all the young lads got killed. Never again. That war." Despite the loss of more recent memories she can still remember the last time she saw her sweetheart. He and her had been left alone together on his last night before he went off to war. Somehow Violet’s sense of propriety, or her shyness, inhibited her. Her sweetheart went off to war unsatisfied. She has regretted this ever since. 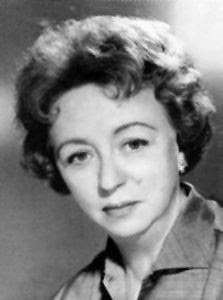 And this is a masterly performance from Thora Hird. 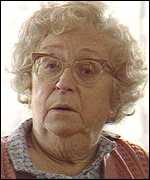 Almost ninety at the time, and playing a character ten years older. As the tale unfolds she deftly switches voices to recite the words of the nurses and the other inmates. And, despite the sadness of the tale, Bennett still gives Hird a few funny, surrealistic yet typically northern lines. She delivers these with superb timing. - Violet is recalling how Rennie, another elderly, deluded lady inmate who is always telling people that she’s waiting for a taxi. "Rennie, where is this taxi going to take you?" Violet asks her. "To my mam and dad's in 1947." says Rennie. "Well if he can take you there I bet he does a spanking trade." We hear of the indignities that the elderly patients are subject to: being dressed in the wrong clothes, even given the wrong teeth. But we see the affection that Violet feels for some of the staff. And in particular one of the male nurses, Francis. And we discover that a lady of ninety can still look at a young man's body and admire it. Then, at the end, after Rennie has died, "well he (the taxi) came in the end." Her nurse friend Francis dies too. By now Violet has had enough, we sense that she won't last much longer. A telegram brought the United States into the First World War and finally brought the massive slaughter to a close. The Zimmerman telegram was an encrypted communication between the German Foreign Secretary and the German ambassador in Washington. It was intercepted by the British and decrypted by Room 40, Britain’s cipher decryption centre. The conflict finally ended in 1918. Yet it was only twenty two years later that the lie of a war to end wars was revealed and the Second World War started. Bennett finds a new way with the short story form that was hugely popular in 1918. He gives it a facelift and preserves the superb performance of a fine actor. Waiting for the Telegram is something very special.